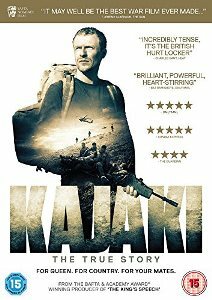 Consciously attempting to remedy British cinema’s dirge of contemporary war films, outshone as they usually are by the superior American model, Kajaki (2014), the feature debut of Paul Katis, is a retelling of a harrowing true story that is notable both for its brutality and outstanding bravery. With a script developed by Katis and screenwriter Tom Williams, and based on extensive interviews with the surviving soldiers involved in the events, the film is an expertly crafted commemoration that focuses on the War on Terror in nightmarish microcosm. Set in 2006, the film sees a group of soldiers from the British Army’s 3rd Battalion, The Parachute Regiment [3 Para], who are stationed at the Kajaki Dam in Afghanistan. A sprawling, desolate location has its apparent calm shattered when the troops spot hostile forces, and immediately set out to disable a Taliban roadblock. While journeying through a dried-out riverbed at the foot of a ridge, one of the patrolmen inadvertently detonates a landmine, blowing off his own leg and sparking a frantic rescue mission. As his fellow soldiers scamper to come to his aid, the group find themselves wading, unwittingly, into an unmarked minefield; a relic of the Russian invasion of the 1980s. With supplies diminishing fast and the deadly threat of further static, unexposed mines lurking beneath every footstep, the group seem to face insurmountable odds, and must risk their lives in aware of the potentially tragic consequences. Released in a year in which war memorial is very much at the front of the cultural mind, Kajaki is a heartfelt, unassuming and refreshingly apolitical film that captures British soldiers in a modern conflict – something that hasn’t been done since the days of the Second World War. Contrasting the serene, beautiful landscapes of the country with the central narrative horrors, Katis teases out the slow-drip progression of the story with an extremely confident handling of the suspense inherent with a frustratingly unknowable antagonistic force such are landmines. Similar to Kathryn Bigelow’s outstanding bomb disposal drama The Hurt Locker (2008), though without the use of slow motion as a device, the film ratchets up the tension using the simple factors of humanity’s fight for survival when pitted against forces far beyond their control. Another strong aspect of the film is its focus on the minutiae of being a soldier, from the care packages they’re sent, to the casual camaraderie they share, however blighted it is at times by basic and predictable dialogue. Boosted by a strong cast that’s a mixture of unknown stars and established British talent, Kajaki excels by giving an unadulterated and honest account of the survivors’ experience, foregrounding the importance of teamwork over an abundance of gratuitous action sequences. Though its final coda is soundtracked so as to give it an unnecessarily cloying and compassionate edge, this is largely an unflinching and incredibly moving exploration of the physical and mental brutalities of war and the pangs endurance when in an intensely confined dilemma.